Another rare breed of artists who use modern technique of slamming grind-death within old-school death metal structures. For all their shortcomings, this approach is aligned with their vision of telling a good horror/slasher story and the result does not disappoint. When we encountered Boston band Scalpel, it was a breath of fresh air. While some of the frenetic post-‘core deathgrind influences were present, this band made it clear through their songwriting that their hearts were in the older traditions of the underground. In fact, their sound resembles a cross between a Unique Leader West Coast-style blasting percussive death metal band, and an East Coast outfit, like some of the Suffocation material from their live album era before they fully modernized. Scalpel bash out the intricate textural descents of percussive death metal on Sorrow and Skin, their opus coming out this month. Read on for a Q&A with one of metal’s rising but undiscovered hopes. We were able to snag the band for a few questions and enjoyed their laconic but incisive answers. How did Scalpel form, and how did your style evolve after that point? Scalpel formed when Taylor Brennan and Manny Egbert met each other at guitar summer camp like good little childs. 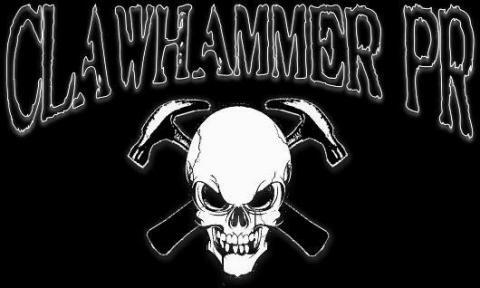 We started as a goregrind band with lots of Carcass style riffs before developing a more technical and brutal sound. What would you identify as your influences, musically and in literature, film and non-fiction writing? Musically, our influences are bands like Creedence Clearwater, Black Sabbath, Morbid Angel, Suffocation and Carcass. We all enjoy films such as Ip Man, Rambo, The Reanimator, and Clockwork Orange. We also love authors such as J.R.R Tolkien, Kurt Vonnegut and Hunter S. Thompson. Your style seems to approximate a mixture of East Coast and West Coast death metal influences. Are you the crest of a new wave? Yes, although we do not try to align ourselves with any other contemporary death metal bands, we do feel that we have a unique sound. Where did you record Sorrow and Skin? Sorrow and Skin was recorded at Q Division Studios in Somerville, Massachusetts. No metronomes were used in the recording of the album in order to produce a more organic sound. To what degree do you take influence from “modern” styles of metal, specifically the post-2000 ones? Mostly, the extremely quick tempos and incessant blast beats. Other than that, we stick to our roots. Where do you hold on to older styles, and why? Slam riffs, fuzzy production, and shrieking bluesy guitar solos are all elements reminiscent of older styles. We think it is better to draw influence from older groups and expand upon the foundations of death metal than to keep up with modern standards. Will you be gracing us with your presence with a tour? Yes, we hope to tour Europe in the future. We look forward to bringing our brand of Death Metal to a new audience as well as making friends in new places. How do you compose these songs? The songwriting process sets in much like an attack of diarrhea; an idea will hit Manny or Taylor, and it goes from there. The song starts usually in the form of death metal scatting (fa na na flum flum) and we finish each other’s song ideas and hash out the rest at practice. What, in your view, is the “soul” of death metal? Death metal serves the purpose of being a lens into the darkest side of humanity, and making light of the most disturbing things that humans can achieve. Without the outlet of Death Metal, the world would seem deceivingly positive. Boston death metal band Scalpel release their debut full-length, Sorrow and Skin, tomorrow (September 3rd) via Sevared Records. To mark the occasion, SCALPEL teamed up with DeathMetal.org for the premiere of album track “The Black Juices.” Stream the tune at this location. 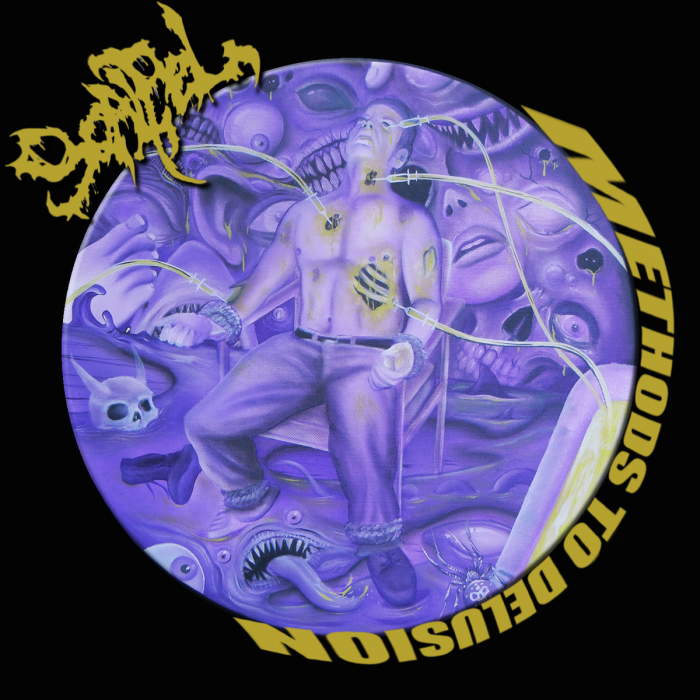 Creating brutal percussive death metal in the style pioneered by Suffocation, Scalpel integrate West Coast influences (Deeds of Flesh) with their traditional East Coast approach and mix in dissonant melody and more frenetic song structures. To hear more of their music, watch videos on the Scalpel official YouTube channel at www.youtube.com/scalpelofficial. To celebrate the release of Sorrow and Skin, Scalpel will perform with the mighty GORGUTS on September 8th at The Palladium in Worcester, Mass.. The band will follow that gig with another blockbuster opening for MORBID ANGEL on November 10th at The Middle East in Cambridge, Mass. 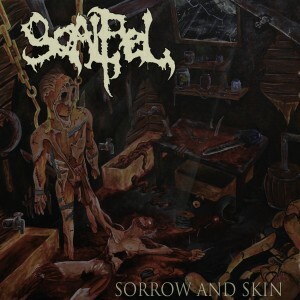 To order your copy of Sorrow and Skin, visit the band’s store at www.scalpel.bigcartel.com. On September 3rd, Sevared Records will release Sorrow and Skin from Boston Death Metal Force Scalpel. Unlike most metal music of this time, Scalpel preserves the old school compositional framework and incorporates some modern metal touches. In style, Sorrow and Skin represents a mix between West Coast dynamism and East Coast rhythmic intensity in the style of metal pioneered by Suffocation and Deeds of Flesh. Working melody into their blasting intensity, the band craft small adventures in power chords. DeathMetal.org is pleased and honored to be able to live stream a track, “The Black Juices,” from Scalpel’s Sorrow and Skin. As this release works its way through the underground we are convinced it will win over the dark hearts of many a metal fan. One effect of the recent uptick in nostalgia bands and reunions is that newer bands have seen the light. This illumination is that if a band simply continues where the past left off, it can both have a unique perspective and uphold the traditions that have made metal great. This escapes the dual ills of false novelty and being a tribute band. Scalpel combines the West Coast style of blasting percussive death metal, commonly called the Unique Leader sound after the label that signed the innovators of this style, with the East Coast post-Suffocation form of grinding pneumatic explosive technical death. The result is high-intensity percussion mated with simple riffs that proliferate into layered textures that expand in complexity as the song develops. Sorrow and Skin will immediately call to mind recent Deeds of Flesh and Northeasterners Dehumanized, who made similar percussion-intensive death metal with similar pacing: frenetic, but with lots of pauses and interludes, drawing together high intensity moments like scenes in an atmospheric horror film. Scalpel pair up riffs and let them develop, but keep it simple so that no element rises above the others. The result is high-intensity music that also has enough internal musical meat to keep the brain occupied and searching for meaning in its patterns, which creates a vertiginous effect of discovery when the unpredictable occurs. Use of melody allows songs to embed moods within previous sensations crafted only by the pattern of riffs. While Scalpel uses little of metal’s classic phrasal riffing, preferring the more speed metal percussive and choppy styles, these riffs branch out to include different textures and rhythms. The result is a sense of each song like a mini-golf course, where each riff has a mechanism and after you play through, a surprise that reveals its purpose in the whole. In keeping with the West Coast school of percussive death metal, Scalpel uses the “dog barking into the wind” style of vocals that are both guttural but not exclusively bass-heavy, giving them greater range to match instruments. The result packages a good deal of musical activity within songs that, while made from simple parts, end up being tiny visions of inward journeys that take us to more interesting places than the sum of their pieces. For more information about Scalpel, visit the band store or band website.